At the New Vic Theatre: Whisky Galore (Oldham Coliseum, Hull Truck, New Vic and UK Tour). Theatre credits include: Women In Power (Nuffield City, Southampton and Oxford Playhouse); A Christmas Carol (Stephen Joseph Theatre); Peter Pan (Mercury Theatre); Cinderella (Octagon, Bolton); Fuse (Crucible, Sheffield); Macbeth (Infinite Jest – London and Holland); The Life and Death of Martin Luther King (TNT – European Tour); The White Witch of Rose Hall (Broadway Theatre); In the Night Garden (Minor Entertainment – UK Tour); Rapunzel (Tutti Frutti – Lawrence Batley, Poland, Hong Kong); In a Pickle (Oily Cart/RSC – Royal Shakespeare Theatre and UK Tour); Ring a Ding Ding (Oily Cart – Unicorn Theatre, UK Tour and New York). Television and Film credits include: You Can Do Better (Pilot); Asylum (Solent TV), In a Rush (Shea Black Productions). Alicia studied at Royal Holloway, University of London, first obtaining a BA Hons in French and Italian before going on to do an MA in theatre. She trained as an actor at Identity Drama School and performed in 3 showcases. 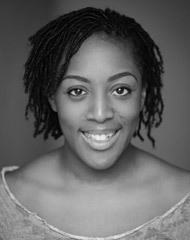 Alicia is also an alumnus of both the National Youth Theatre, and National Youth Music Theatre.